"The Lion and the Rose" is the second episode of the fourth season of HBO's fantasy television series Game of Thrones, and the 32nd overall. The episode was written by George R. R. Martin, the author of the A Song of Ice and Fire novels of which the series is an adaptation, and directed by Alex Graves. It aired on April 13, 2014. 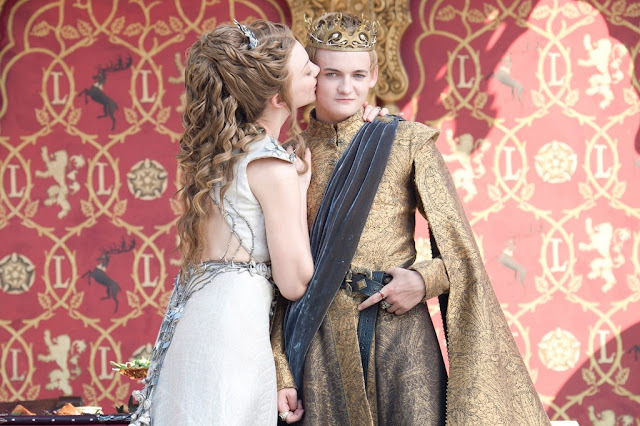 The episode focuses principally on the long-awaited royal wedding between Joffrey Baratheon (Jack Gleeson) and Margaery Tyrell (Natalie Dormer). Other storylines include House Bolton's quest to retake the North, and Bran's continued journey north of The Wall. Ramsay Snow (Iwan Rheon) sadistically hunts a young girl in the woods, with the assistance of his servant, Reek (formerly Theon Greyjoy) (Alfie Allen), and his bedwarmer Myranda (Charlotte Hope). When Ramsay's father Roose (Michael McElhatton) arrives at the Dreadfort with his new wife Walda (granddaughter of Walder Frey) he asks to see Reek, and chastises Ramsay for having castrated and tortured him. Roose intended to trade Reek to the Ironborn in exchange for Moat Cailin, a fortification that is preventing the Bolton army from returning to the north, which forced Roose and his party to have to be smuggled back to their own keep. Ramsay, in an effort to prove how well he has broken him, has Reek shave his face. While doing so, Ramsay coaxes Reek into admitting to Roose that both Bran and Rickon Stark are alive, as he could not find them, and burned two farm boys in their place while holding Winterfell. Ramsay also spitefully tells Reek that Roose murdered Robb Stark ("The Rains of Castamere"), who had once been like a brother to Theon. Despite this, a visibly emotional Reek completes his shave without harming Ramsay, thus proving his trustworthiness. Roose dispatches Locke (Noah Taylor) to find and kill Bran and Rickon, as while they are alive they pose a threat to his new position as Warden of the North. Ramsay suggests that they also find and eliminate Jon Snow, who has Stark blood in him and will also likely oppose the Boltons. Roose also orders Ramsay, along with Reek, to capture Moat Cailin, implying that he will reward Ramsay by legitimizing him as a true Bolton. Bran (Isaac Hempstead-Wright), while using his abilities as a warg, sees through the eyes of his direwolf, Summer, and kills a doe. Awoken by the voice of Hodor (Kristian Nairn), he is then reminded to use the warg abilities sparingly by Jojen (Thomas Brodie Sangster) and Meera (Ellie Kendrick), as spending too much time as Summer will cut him off from his human body. After stopping at a weirwood, Bran has a vision of the three-eyed raven, his father, dragons flying over King's Landing, and his paralyzing fall at Winterfell. In the vision he hears, "Look for me, beneath the tree...north." Bran reveals that he knows where the group must go. At night, Melisandre (Carice van Houten) orders several of Stannis Baratheon's (Stephen Dillane) subjects burned at the stake, including Lady Selyse's (Tara Fitzgerald) brother Ser Axell Florent, as a tribute to the Lord of Light. At a private dinner with Stannis, his wife Selyse, and Melisandre, Selyse expresses her disgust towards her daughter, causing Stannis to angrily defend the girl. After dinner, Melisandre speaks to Shireen Baratheon (Kerry Ingram), Stannis and Selyse's daughter, about the Lord of Light, and how the Seven Gods are a lie. Despite her young age and sheltered life, Shireen appears somewhat suspicious of Melisandre and cautiously talks with her. Jaime (Nikolaj Coster-Waldau) reveals to Tyrion (Peter Dinklage) his embarrassment at the loss of his sword hand. Tyrion encourages him to train his left hand and arranges for clandestine lessons with Bronn (Jerome Flynn), provided he is paid. On the way to the wedding breakfast, Lord Varys (Conleth Hill) informs Tyrion that the Queen knows about Shae (Sibel Kekilli), and will soon tell their father, Tywin (Charles Dance). Lord Mace Tyrell (Roger Ashton-Griffiths) presents King Joffrey (Jack Gleeson) with a large gold goblet, and Tyrion gives him a rare book, before he is presented with the second Valyrian steel sword that Tywin had forged. Joffrey uses the sword to slice through the large book. In his chambers, Tyrion tries in vain to get Shae to leave, but succeeds only when he lies that he could never love a whore. Bronn escorts the forlorn Shae to the boat and later assures Tyrion that she has indeed left for Essos and is out of harm's way. After the wedding, Tywin and Lady Olenna (Diana Rigg) trade barbs at one another. Olenna reminds Tywin of the debt the Crown now owes to the Iron Bank of Braavos. Jaime threatens Ser Loras Tyrell (Finn Jones) by telling him that, should he wed Cersei (Lena Headey), she would likely kill him in his sleep, and Loras retorts with an implication that he knows of Jaime and Cersei's incestuous affair. Brienne of Tarth (Gwendoline Christie) is confronted by Cersei, who accuses her of being in love with Jaime. Margaery (Natalie Dormer) announces that the leftovers from the feast will be given to the city's poorest residents, earning much acclaim. Cersei, bitter at her loss of power and disapproving of Joffrey's new queen, confronts Grand Maester Pycelle (Julian Glover) and threatens to execute him if he does not leave the wedding and command the feast chefs to give the leftovers to the royal hounds instead. Tywin and Cersei are later confronted by Prince Oberyn (Pedro Pascal) and his paramour, Ellaria Sand (Indira Varma). The four share a tense conversation filled with veiled insults, where Oberyn reminds them that Cersei's daughter Myrcella is currently being held in Dorne. The events are then interrupted by Joffrey, who presents a crude play with dwarves depicting the War of the Five Kings, to the amusement of some guests but to the disgust of many others. Loras leaves in anger when his relationship with Renly Baratheon is mocked by the play. Tyrion is infuriated at the distasteful spectacle. Sansa (Sophie Turner) is nearly brought to tears by the depiction of her recently deceased brother, Robb. Joffrey tries to get Tyrion involved in the play due to his size, but Tyrion refuses, instead requesting Joffrey display his own talent with a sword. Humiliated, Joffrey orders Tyrion to be his cupbearer, toying with him by intentionally dropping and kicking the goblet. Eventually, Tyrion fills the goblet and hands it to Joffrey, who repeatedly orders his uncle to kneel, but Tyrion is defiant. Margaery defuses the situation by drawing attention to the wedding pie. As Joffrey eats the cake that Margaery gives him and drinks wine from the goblet Tyrion gave him, he begins choking. While the emergency draws the crowd's attention, court fool Dontos (Tony Way) implores Sansa to flee with him. As Lady Olenna yells for everyone to assist the king, he falls to the ground and it becomes evident that he has been poisoned. Before dying, Joffrey points accusingly at Tyrion, who is examining the dropped goblet. Furious with grief, Cersei orders Tyrion arrested on charges of murdering Joffrey.